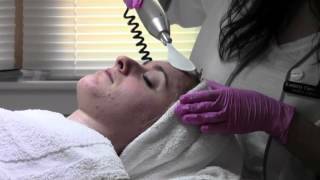 Dr. Eric Bernstein explains Vibradermabrasion, a type of Microdermabrasion procedure. Nurse Kim wraps up Vibradermabrasion treatment with patient. It is good to exfoliate their facial skin from time to time and professional microdermabrasion is one of the best ways to do this. "Microderm" is a procedure performed in many aesthetic physician offices to remove the top layer of sun-damaged and dead skin cells. While it may have little effect on deep wrinkles or major scars, getting rid of this outer layer (the stratum corneum) can be an effective way to freshen up your skin and achieve a healthier, younger appearance. The simplest explanation of how the microdermabrasion process works is that an abrasive surface is used to smooth out the top layers of the skin, similar to how sand paper would be used to smooth out a piece of wood. The idea of "sanding" your face may sound unpleasant at first but many people that have undergone the procedure describe it as a painless or even an enjoyable experience. With many day spas, medispas and salons offering this "lunchtime procedure" you may ask "Why should I go to a doctor's office to have microderm done?" While there is very little risk of negative side effects associated with this treatment, the capability of microdermabrasion machines has increased over time and only a trained skin expert will have the knowledge of how to get the best results. Physician supervised clinics will often combine microderm with other procedures, such as chemical peels, or products to maximize the effects, getting you the most for your money. When it comes to facial rejuvenation, a consultation with a physician trained in proper skin care is always the best advice.